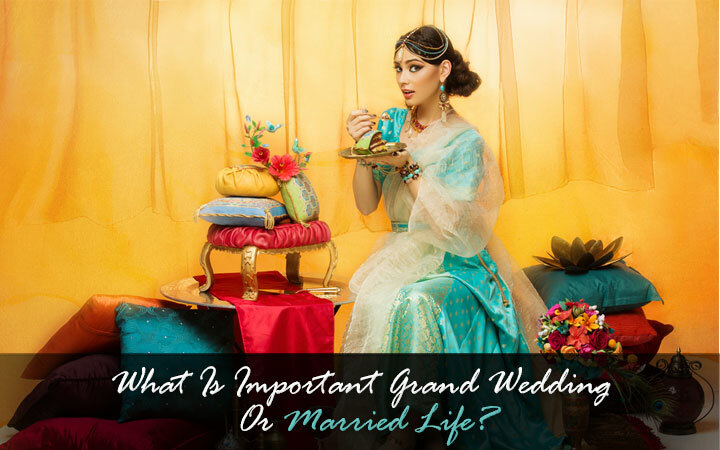 What Is Important Grand Wedding Or Married Life? What is important grand wedding or a married life? Seriously,new couples need to think and understand life after marriage has the priority over a grand wedding. Most people only plan for the grand wedding or the ceremony and the related festivities. They forget that marriage isn’t all about merry making. The multi-day events are all about food, gatherings, ceremonies and rituals but nobody pays attention to the fact that marriage isn’t about decorations and spending money. Grand Wedding Or Married Life? The focus needs to be on the vows, the deeper meaning of marriage- trust, honesty and being there for each other through thick and thin. Despite the religions and nationalities, marriage is a harmonious union of two people and it is essential to understand that they should be compatible. Irrespective of whether you are getting to know each other, as in an arranged marriage or marrying the love of your life, the fact is being compatible, having the same goals as a couple. Most young people have traveled or studied abroad and have had a chance to see the positive aspects of different cultures. They have started to think differently. It is not about the honor or family’s respect, but people have a tendency to spend extravagantly on marriages forgetting that the attendees would not remember it anyways. It makes more sense to think about other important things about marriage, instead of only worrying about the dress of the bride/groom, the menu for the various ceremonies and what the relatives will say. Investing the money for the future of the couple makes more sense than spending it on wedding trousseau that might never see the light of the day. Thus, think about what you want- a grand wedding or happy married life with perfect understanding.